It's possible that the text field parameter value was not added in your email notification template. Please delete the old notification template and create a new. I did what you recommended but didn't work. I text field does not have field details information with unique name or field ID. could that be the problem? By default the headers, text fields are not included in the notification emails. You'll be able to add only the fields from the form to the notifications. However, the email composer is a full editor that allows to you to insert graphics, create tables, etc. 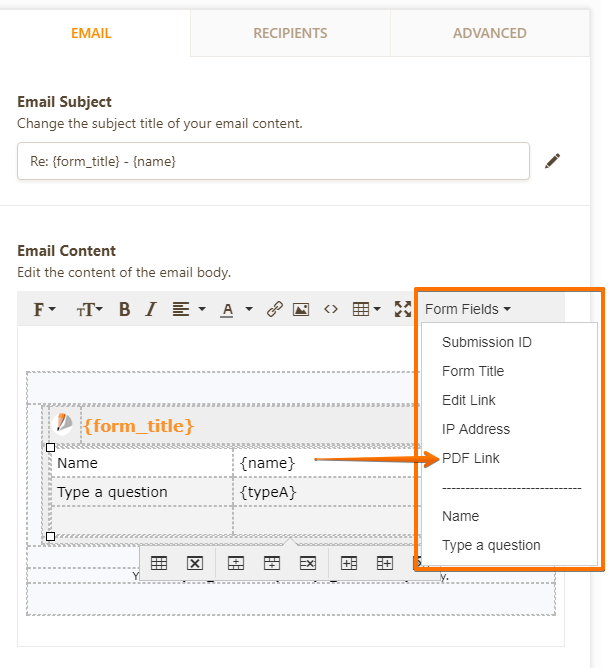 The headers or text on your JotForm can be copied and pasted here in the email content. You may also want to refer to the following guide that the submission can be included with the text and headers. So that you can place a PDF link on your email notification as well.